More from Ainsley's 6/7 month photo shoot... of us boys! As you can see, we are hard at work building a fort with our neighbor Wyatt. Dad thinks it's silly, but we had a 100 Days of School celebration on Friday (Ben had his on Thursday - Kindergarten is a day behind). Mom came and helped and took this funny picture of me and my friends Raghav and Shaelyn. The light was hitting me just right and I happened to notice my shadow. By the end of the morning, I owned my shadow. This is a picture of me and Piper, my favoritest neighbor. She is my favorite because she comes over and plays with me and then she feeds me. If she would just change my diapers, I think Mom and Dad would let her move in. Daddy got some lights and a back drop kit last week and we put it to good use last night. 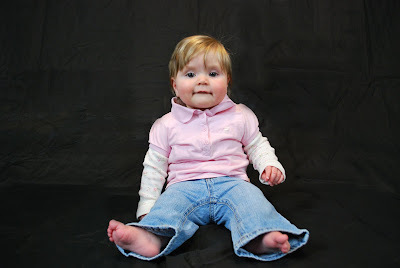 Here's a sneak peek of my six month pictures. Dad is working on setting up our photo studio and the only subject that was willing to participate was Violet. How does she look? Today, we had six deer in our backyard, three on each side of the pine tree. Can you find them all? Happy Valentines Day, everyone! Today, I sat with my brothers while they put together Star Wars LEGO kits. It was awesome! 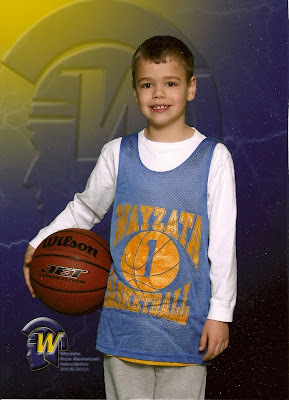 My basketball pictures came late last week. Check 'em out! 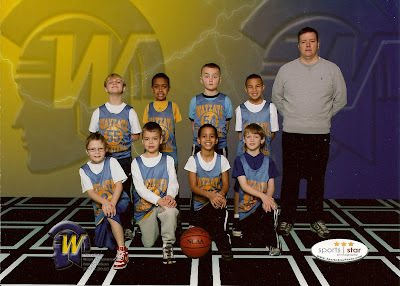 Even though we finished the season 0-7-1, our coach made sure we had fun and learned some basketball skills. Here are two fun projects that I just brought home from school. This is a tiger from art class. This is the outside of my government folder. We got to go to Plymouth's city hall and meet the mayor, among other fun things. Dad got some new lights for the camera and decided to test them out on me. Can you tell which pictures were with the flash and which pictures were the new lights? As I understand it, the messes from a biter biscuit are legendary in my house. Apparently, I'm no exception.